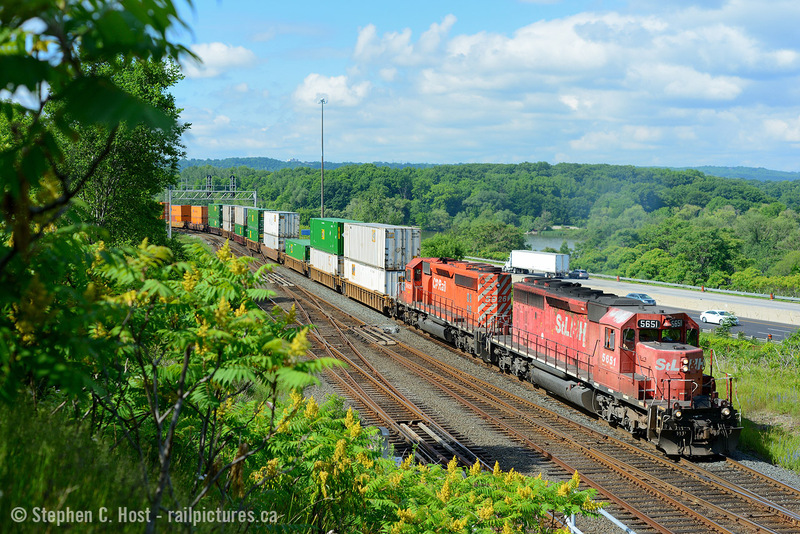 Railpictures.ca - Stephen C. Host Photo: When CP 142 was added on the Hamilton sub it was a gift from the gods. Not only was junk power assigned, which now needed pushers to get up the hill, it often ran in Daylight in the mornning due to delays. Here is the head end of the train as they rolled by Desjardins. We’d crawl back up the hill to get to York Rd for a photo of the pushers curving up the hill. Since the pushers had 1st and 2nd generation EMD, the drama was amazing. Here’s a shot of a different train with the pushers getting a workout! . The GE’s quickly invaded as did the ECO’s.. about a year later it wasn’t as good as this! | Railpictures.ca – Canadian Railway Photography – photographie ferroviaire Canadienne. Caption: When CP 142 was added on the Hamilton sub it was a gift from the gods. Not only was junk power assigned, which now needed pushers to get up the hill, it often ran in Daylight in the mornning due to delays. Here is the head end of the train as they rolled by Desjardins. We'd crawl back up the hill to get to York Rd for a photo of the pushers curving up the hill. Since the pushers had 1st and 2nd generation EMD, the drama was amazing. Here's a shot of a different train with the pushers getting a workout! . The GE's quickly invaded as did the ECO's.. about a year later it wasn't as good as this!